Ground faults in commercial fire alarm systems are difficult to find. An electrical ground fault is unintentional grounding of an electric wire. This accidental ground causes a current leak, which means devices on the affected circuit may not work at all or may falsely signal an alarm condition. Most fire alarm control panels can warn that a ground fault exists, but can't say where it is, so technicians have to use a multimeter to pinpoint the fault. 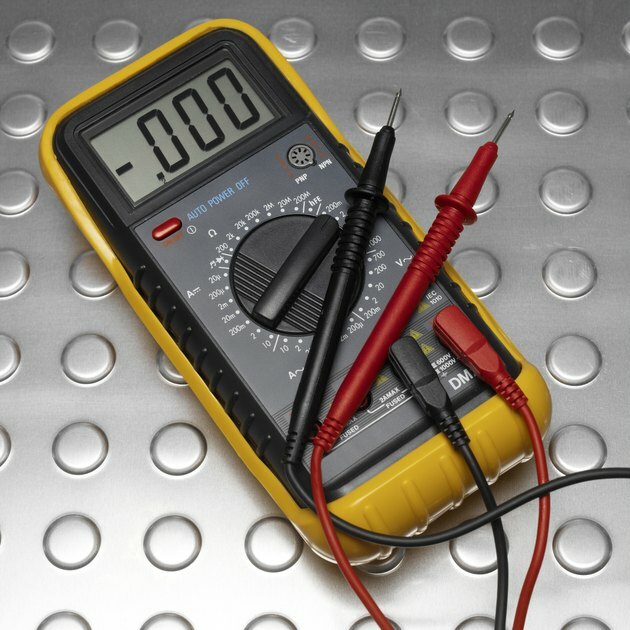 A multimeter can locate ground faults in fire alarm circuits. A ground fault on the positive or hot side of the circuit usually results in a short circuit and immediate tripping of the circuit breaker. A ground fault on the negative or neutral side doesn't necessarily short out the circuit. Instead, it can drain off enough electricity to cause odd and intermittent circuit troubles. A negative ground fault can also electrically energize fixtures and places never meant to carry power, creating a shock hazard to anyone touching the hot spot. Hunting a ground fault is a process of elimination. First, disconnect all alarm circuit wires from the main control panel. Each circuit will have two, three or four conductor wires. Disconnect all the wires. This should reset the panel's ground fault indicator. Reconnect one of the circuits and wait 60 seconds to see if the ground fault indicator turns on. If it stays off, reconnect the next circuit. Repeat until you find the circuit that triggers the panel's ground fault indicator. That's your suspect. An old alarm system may have more than one ground fault. Disconnect the suspect circuit again and mark it. Continue reconnecting the rest of the circuits, looking to see if the ground fault indicator goes on again. Make sure all wires of the suspect circuit are disconnected from the main panel. Take out your multimeter and set it for ohms. That's the symbol that looks something like a horseshoe. Use the lowest ohms setting. Touch the multimeter's black lead to a grounded metal surface and touch the red lead to each wire of the circuit. A meter reading of infinity, O.L., Open Loop, or a needle that stays all the way to the left of the scale indicates an open circuit with no path to ground. That means the wire is OK. Any other reading on the meter indicates there's an accidental path to ground somewhere along that wire. Now that you've found the faulty conductor, your next step is to physically check that wire along the entire circuit. Take your meter and move down the circuit to the first device. Disconnect the wire on the side of the device that's "downstream" from the main alarm panel and test the wire with the meter. If the meter still shows a ground fault, the problem is further down the wire. Move to the next device on the circuit, disconnect on the downstream side and test again. Repeat until you find the faulty segment. Closely inspect that segment until you find the bare wire, pierced insulation, cross connection, corroded connection or defective device causing the ground fault.